(ii) in small works where charging machines are not installed, is a front man q.v. or a scoop driver q.v. who fills retorts with small coal by hand with a scoop. a retort charger q.v. who periodically charges retorts with crushed coal by moving levers of a retort charging machine. attends to fires of generators that heat retorts. a retort charger q.v. who, with assistance of one other front man lifts scoop of coal up to mouth of retort with an iron bar (called a bridle); see also scoop driver; this operation is now being superseded, except in small works, by mechanical means of retort charging. 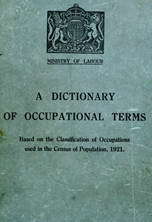 general term for any man working in gas house. (ii) see gas house man. in charge of any type of machine used for charging and/or discharging retorts at gas works; sets machinery in motion by moving a lever; usually also oils and cleans machinery as required. forces coke out of retorts with mechanical ram (compressed air, hydraulic, or electrical); controls machine by levers; usually done by machine driver q.v. employed alternately in charging and in drawing. general term for any man working in retort house doing work of retort charger or discharger, augerer (699), lid cleaner (699), opener and closer (699), hydraulic main attendant (699), etc. a retort charger q.v. who co-operates with "front men" q.v. in lifting scoop of coal up to mouth of retort; balances and guides scoop when lifted, pushes it into retort, empties it by turning it over, and removes it for fresh charge; operation now being superseded, except in small works, by mechanical means of retort charging. one of a gang of men stationed at back of retorts and working in conjunction with machine driver q.v. ; opens retort doors and doors of furnace' at back of retorts and pushes hopper into position so that, as coke emerges from retort, it falls into hopper and thence into furnace; pokes coke with iron rod to quicken its passage into furnace; shuts retort doors when charging and drawing process is complete; shuts furnace door when furnace is stoked, allowing rest of coke to fall into conveyor or into wheel barrows. a gas stoker q.v. working in retort house where projector chargers are used, who holds a stopper against open end of retort, furthest from machine, to prevent coal projected by machine from falling out at back of retort. (ii) discontinuous process, opens door at top of vertical retort, fills retort with coal from hopper by moving a lever, and closes door.